I used to read my parent’s copies of Newsweek in those days to pretend I understood the articles, and if it weren’t for that, I don’t know if I ever would have gotten involved in gaming at all. Maybe one day I’ll write an alternate history for myself where my parents subscribed to Time instead, I never learned about Tomb Raider, and instead I became a nuclear physicist and solved the forthcoming energy crisis (why not? )Anyway, I went to Funcoland (hey, remember that?) determined to get a PS1 and TR2. To the salesman’s credit, he talked me into buying a copy of the original instead. It wasn’t long before I fell in love with TR1 and ignored my obsession with Lara in the snow as depicted by Newsweek, and it took me sufficiently long to beat TR1 that I almost forgot about it entirely. Eventually though, I purchased the sequel and it was time to experience a new Lara voice, new gymnastics, vehicles, and that mesmerizing braided ponytail. My feelings on this game are not popular on the internet, nosireebob. TR2 is kind of a sacred cow of the fandom. Opinions differ when the series started to go downhill; some think it wasn’t until recently, others think it was the latter Core sequels like Chronicles (TR5), others think it was as early as TR3. But just about everyone agrees that TR2 represented the franchise at the height of its ingenuity, and certainly popularity. Everyone except…err, me. Now, I don’t hate TR2; it has some great environments, and unlike the first game it provided a satisfying conclusion to Lara’s adventure. However, somehow it leaves me somewhat cold compared to the first one. TR1 I love, TR3 I have a love/hate relationship with (meaning I love it to death in between bouts of cursing the difficulty), TR2 I’m just confused by. I want to love it the way other fans do, but a couple of things hold me back. First of all, I hate the emphasis on human enemies. Not only do I find shooting them tedious and annoying rather than fun, the constant intrusion of poorly rendered, blocky henchmen breaks up the sense of solitude and even wonder that I associate with Tomb Raider. 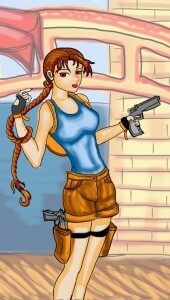 There’s also the fact that in general, I’m more comfortable with the idea of Lara killing only wild animals for self-defense than gunning down dozens of people, but that’s a secondary concern; I would probably be more willing to forgive the game’s high body count if I found the gun battles more fun to play. Second, the storyline isn’t as good as TR1, leaving me with less motivation to play through the levels to see the thing to its end. I know you never really play a TR game for the story, but I consider it all part of the package; a compelling story isn’t mandatory to enjoy the environments, but it does help tie everything together. The TR1 story may have been fairly simple and unrealistic, but it was certainly compelling: You just had to know what craziness that darned Natla was planning next, and I hope I showed in my annotated playthrough that there may have been some interesting thematic stuff going on under the surface. Third, I find Lara’s characterization less likable in TR2. Part of that is due to preferring her first voice actress over Judith Gibbons (who I’ve no doubt is a perfectly nice woman in reality, but sounds incredibly frigid as Lara), part of it is her dialogue. In TR1, despite being tough as nails, she was unfailingly polite, a callback to her mannered upbringing. Remember her apologizing to Larson for interrupting him while he threatens to shove the scion somewhere unpleasant? In TR2 they seemed to have forgotten that trait, making her too much of a seemingly emotionless Larabot. Don’t get me wrong, I don’t like hyper-emotional Lara (cough, Legend, cough) and consider the character very stoic in general, but I think the balance was perfect in TR1 and then TR2 knocked it off-kilter. Fourth(! ), the game hits a wall for me early on in that whole underwater section. I know there are some great bits of gameplay scattered throughout, but on the whole the area is a lot of running around inside areas with similar colors and textures, and when you do get to swim you’re usually in serious danger of drowning. I can appreciate what they were trying to do with this level set, but it’s claustrophobia-inducing and seems to go on about two levels too long; I don’t feel like I’m really playing Tomb Raider proper again until Tibetan Foothills. Fifth, I’m still ambivalent about the “save anywhere” system; in theory it’s more player-friendly than the save crystals, but I find knowing I can save anywhere tends to make me more careless, leading to a lot of staring at the loading screen. Plus, saving all the time is tedious, so you tend to go long stretches without saving, only to occasionally kill Lara and have to repeat half the level with the full knowledge that this is entirely your fault. Letting the player choose where to save gives the player more responsibility, but that’s a responsibility I’m not sure I even want; save crystals were so delightfully simple in comparison. You either made it to the crystal, or you tried again until you did, period. And yet, there are some aspects of the game that make me want to forgive all of these things: the urban environment of Venice really works, and we get to run around on rooftops in a way we never did in the first game. Lara’s new moves- climbing walls, changing direction in mid-air, and so on- make for much more varied platforming. Barkhang Monastery is…Barkhang Monastery is perfect. Pretty much everything about it. And the final boss fight is truly epic, something I didn’t even think was possible with the Tomb Raider control scheme. But at the end of the day, it’s not my favorite in the series and I really don’t know how I’m going to rate the levels. I’m somewhat afraid of being tarred and feathered by TR fans for giving some of the levels in this game low uzi-clip ratings, but on the plus side, I really have no idea how most of the levels will score until I play them again (as opposed to TR1, where I had a pretty good idea how I was going to rate everything from the beginning.) I guess it’ll be a surprise for everyone.